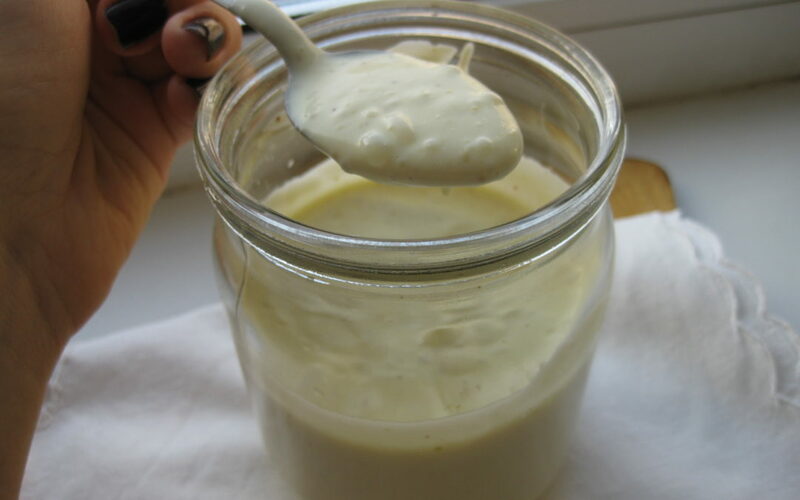 If you’ve never made mayo yourself, it can seem intimidating and scary. And when you’re first getting started, there can be a bit of trial and error. But, don’t give up! When you finally do get it right, you will be so happy and will never want to go back to store-bought mayo again! Combine egg, ¼ cup olive oil, vinegar, garlic, mustard and salt in the bottom of a glass jar. Let it sit on the counter for however long it takes for everything to come to room temperature (usually about 2 hours). Looks gross now, but trust. It will be amazing. Using an immersion blender, pulse a couple of times so everything is mixed. As the oil mixes with the vinegar and egg, it will go from translucent to opaque and creamy looking. Colloids! Pour in one tablespoon of oil, then use the immersion blender to mix it in thoroughly. Once it’s completely incorporated, add in the next tablespoon of oil and blend. As you add more and more oil, the mixture will become thicker and the pitch of the blender will change. This is good! It will get a little bubbly as the blender whips the mayo. Continue, a tablespoonful at time, until all the oil is mixed in. And you’re done! Pop a lid on the jar and put it in the refrigerator! It’s tempting to pour more oil in, but don’t add any more than a tablespoon at a time. Patience is key. Make sure all the ingredients are completely at room temperature before you start. Make sure all the oil is mixed in before you add the next tablespoonful. You don’t have to do it with an immersion blender. I also frequently do it with a normal blender. Once you find a method using your own kitchen tools that works for you, stick with it. Don’t panic if the mayo becomes a little warm. It’s just the friction from the blending that heats it up. Don’t panic if it’s not as thick as you would like. It will thicken up more in the fridge. In the event of the oil/egg colloid ‘breaking’, resulting in slushy, chunky egg ‘soup’ (this has happened to me more than once), this blog post has been a godsend!